You're going to laugh - Le Tour de France - does not always only tours France! This year, the 103rd edition of the cycle race will start in the French departement (region) of Manche, for the first time in its history. The starting stage of the race will be at the magnificent Mont-Saint-Michel, the super popular island of Normandy (no, not Brittany). And along the way at almost half way, the race will have a day of rest in Andorra. So, see? This is not really France. The Principality of Andorra, its official name, is a sovereign state, albeit micro, in the eastern Pyrénées mountain range separating France from Spain. Created in the year 988, the little space is de facto, a monarchy - without a king - but with two princes, Spaniard Bishop of Urgell, and ...... the President of France in exercise. Weird, right? Andorra is not a member of the European Union (the one Britain just snubbed), but the euro is the official currency of the country - go figure. This European thing can be quite confusing at times. The Tour will also make two stop in Switzerland - now that is definitely not in France, nor in the European Union, and they do not use the Euro as their currency. Someone just wants to pick up chocolates. In 2014, the Tour departed from England - now, that is really far-fetched, that country does not even touch France! and is now no longer part of The European Union either! In 2015, the race galloped through Belgium, and the Netherlands. The Tour in the past visited Italy, Ireland, and Germany. In 2008, Québec applied to be part of the race, but organizers declined, citing jet lag and long airplane flights as disturbing elements for the health of all involved. Twenty two teams (198 riders) of highly trained cyclists will take part in the race this year, from July 2nd to July 24th. Chantilly to Paris will be the last stage. Yes, that Chantilly, where they invented the fluffy cream we put on our strawberries. 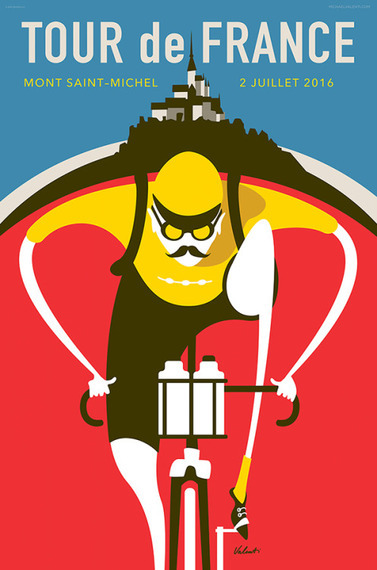 Created in 1903 by a struggling French newspaper to try to sell more copies, the Tour de France is a race within a race. The overall final winner gets to wear the famed yellow jersey (le maillot jaune). But racers also fight for the daily stage victories, intermediate sprints for the green points jersey, plus the mountain points for the stand-out red polka-dot climber's jersey. The white jersey is awarded to the best rider under 25, while the last placed rider overall becomes the winner of the lanterne rouge, the red light at the rear of the peloton. The arrival of the Tour on the Champs-Elysées in Paris is always a massive cheering event gathering thousands on an usually sunny Sunday. Some of The heroes of The Tour. Legendary Belgium Eddy Merckx won the Tour five times; French Jacques Anquetil (who allegedly sipped Champagne from his water bottle during one Tour) won five times as well; American Greg LeMond won three times. Spaniard Miguel Indurain, five consecutive times winner of the Tour, had a skinny imposing size (six-two, 176 pounds), possessed a super-human lung capacity, and a resting heart rate of 28 beats per minutes that would qualify most humans as dead. Another American, Lance Armstrong, is the winner of seven consecutive Tours, but since he was stripped of his titles for doping, I guess that does not count, or he would have been the most winning rider in the Tour history. A British citizen born in Kenya, Chris Froome won the race twice. 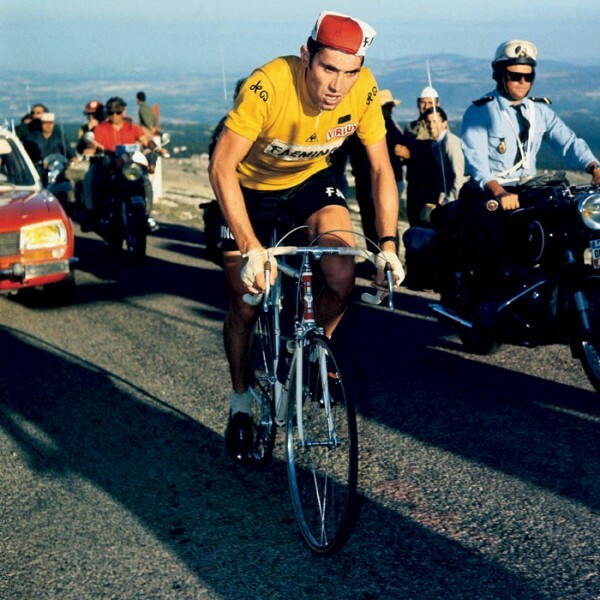 His performance in climbing the Mont Ventoux, a very difficult stage of the race, has become the stuff of legends. He was the winner of the Tour in 2015. Sometimes braving heat waves weather, spectators have taken the habit of hosing down the riders passing them by. The stages include three categories: flat stages, medium mountain stages, and mountain stages. The 2016 race will be 174.7 km (109 miles) longer than last year's, with the same number of rest days. During the entire race, some 4,500 persons are involved in the fantastic event, from bikers to journalists, and everybody in-between. The French postal service has even set up a mail delivery for those away from home from the weeks during the race, and two specially-assigned mail persons make sure every fan letter - or bills- gets to its intended destination. 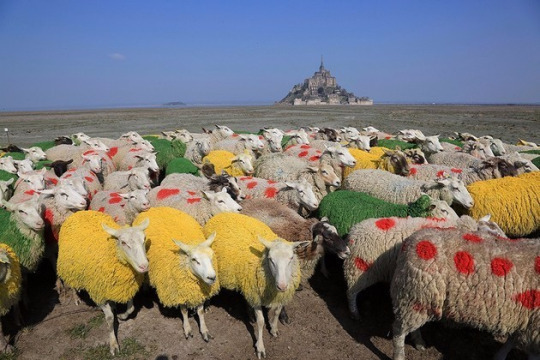 To honor the Tour departing from the Mont-Saint-Michel this year, local shepherds have died their flock with the riders' jersey colors. But, no worries, it does not hurt them, they will be shaved. For the 2016 race, the difficult stage of endurance and climbing that is the Mont Ventoux is returning; the naked windy mountain in Provence is famous for its harsh limestone environment and its grueling steep ascent, which takes over one hour at best to accomplish. Froome, the defending champion said, when the 2016 route was announced, that he expected the course to suit him better this year. "I think it's going to take a complete cyclist - but the stage that certainly stands out for me is Mont Ventoux." We'll be watching! Good luck to all!